The HUD consists of the user's health, hunger, thirst and experience bars. Unlike in vanilla, there is no armor rating bar. Instead of hearts, health is represented with a red-colored bar and white text overlay. When a player first spawns, they have a maximum health value of 1,000 HP. This value increases and decreases depending on the player's nutrition and experience levels. If a player's max health increases, the bar will update to show the new health available to be regenerated. Health regenerates very slowly over time, as long as the player's hunger bar is at least 25% filled. Mob health is also increased, although not proportionally; creepers for instance have much less health relative to the player than in vanilla. The damage done by a player's fist is also scaled, doing 10 HP instead of the vanilla 1 HP. Swimming in a hot spring will quickly regenerate the player's health. Instead of haunches of food, hunger is represented with a green-colored bar. Players have a stomach capacity of 24 oz. When eating the majority of food, the player can consume a maximum of 5 oz at a time. Sandwiches are the exception, and the player will consume as much as possible to become full. If the hunger bar is filled is above 19 oz, the player will only consume enough to fill their stomach. This means that it is impossible to over-eat, and saturation is therefore only acquired through eating sandwiches and salads. While holding food in the player's hand, the depleted hunger bar will light up slightly, indicating how much that particular piece of food can fill the bar if completely consumed. Unlike vanilla, the hunger bar does slowly deplete over time while the player is standing still. Hunger is primarily depleted by performing actions such as breaking blocks or attacking. If the player sleeps through the night, the hunger bar will deplete half as much as if the player had been awake the entire time. When there is only 25% of the bar left, the player will have a Weakness II and Mining Fatigue II potion effect until the hunger is replenished. If the hunger bar is empty, the player's nutrition will deplete at 3 times the normal rate, quickly decreasing the player's max health. Once the player's nutrition has completely depleted, the player will be left with a max health of 50 HP. In this way, hunger does not directly damage the player, but it does put them in a situation where almost any sort of damage will result in death. Thirst is represented with a blue-colored bar. The thirst bar, like the hunger bar, slowly depletes over time even while the player does not move. It can be refilled by drinking water; either by drinking directly from a fresh water pool with Right Click or by drinking from a ceramic jug. Thirst is primarily depleted by running around. If the player sleeps through the night, the thirst bar will deplete half as much as if the player had been awake the entire time. When the thirst bar is half empty, the player will no longer be able to sprint. When there is only 25% of the bar left, the player will have an invisible Slowness II potion effect until the thirst bar is replenished. If the thirst bar is completely empty, and the current ambient temperature is above 35, the player will take damage simulating a heat stroke. The experience system represents life experience, and so each level increases a player's maximum health and thirst, allowing them to take more hits, and survive longer without drinking. As in vanilla, all experience levels are lost on death, resetting the bonuses attained from them. In addition, players will respawn with partially-full health and hunger bars. Other bonuses such as the expanded crafting grid will be lost. This is designed to encourage players to play more carefully and to protect themselves. 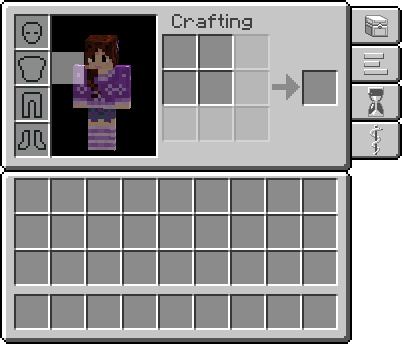 The player's inventory consists of four armor slots, a back slot located on the shoulder of the player model, a crafting grid, and 36 storage slots. There are also four tabs to the right of the inventory to switch between inventory, skills, a calendar, and health. The back slot can hold a quiver, as well as large items such as anvils, sealed barrels, and sealed large ceramic vessels. Larger items will overburden a player, making them unable to move if the item is not stored in the back slot. The only way the crafting grid can be expanded is by crafting a crafting table with four planks. The crafting table will be consumed, and the crafting grid will expand to the 3x3 slots. The expanded crafting grid will not revert back to the 2x2 slots unless the player dies. Note: Many of the crafting recipes have special handlers behind the scenes that require that the player uses the inventory crafting grid. Because of this, while crafting a secondary table will give the block, the block cannot be used normally when placed in the world, and is only used for decoration, or as a crafting ingredient in other mod's recipes. Maximum health possible in the game. Players start with a cap of 1000 points of health, meaning that they have that many points when fully healed. The cap can increase as they rise in levels, but cannot go beyond the value set for this option. Players have 1000 health instead of the vanilla 20. Water is used for sprinting and goes down on its own very slowly. Upon reaching 50% water the player can no longer sprint. At 25% they get a slow debuff. Players gain extra health as they level up. Players gain extra water reserves as they level up allowing them to sprint for ever longer periods of time. When holding food the hunger bar will show a preview of how much of the hunger bar will be restored if the item is eaten. Making a crafting table will consume the item and expand the player's inventory grid from 2x2 to 3x3. This upgrade is lost and must be re-done on player death. Added fresh and salt water. Players can only drink from and fill their jugs with fresh water. Player inventory consists of four tabs: Inventory, Skills, Calendar and Health (currently only displays nutrition). Food changed to weight-based stack system. Hunger bar represents 24 oz worth of food. When the player's hunger catches up after sleeping, it drains at half speed and the player will not take damage. However if the stomach is empty after catching up, the player will be subject to the normal damage rules regarding hunger. Disabled taking damage when the player is starving. Instead, nutrition levels decrease at 3x normal rate. This page was last modified on 20 July 2015, at 19:11.